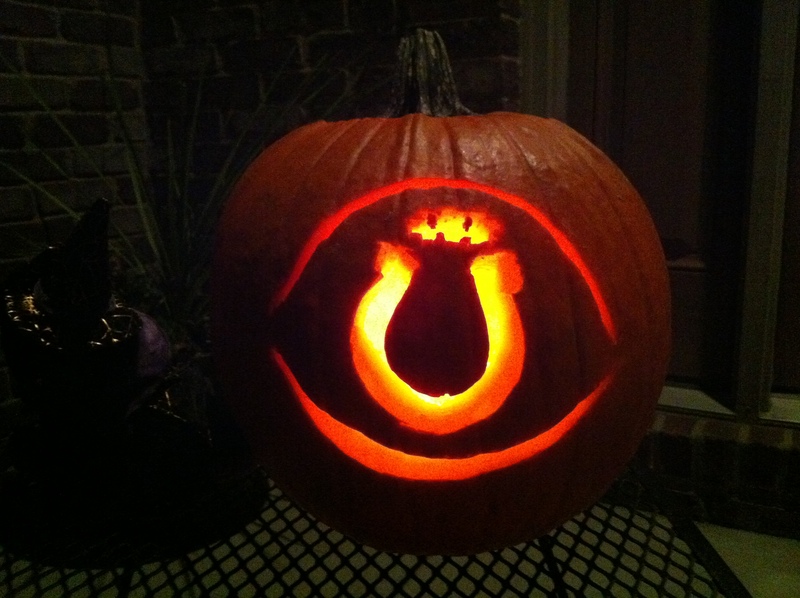 This is one of our favorite traditions. We love the pumpkin patch, the hay rides, the apple snacks, you name it. When we first moved here, we went to the Farmer’s Market in downtown Little Rock, and one of the booths set up was for a winery. I tried their wine and fell in love (For all you Indiana folks, it’s similar to Oliver Wine). When I bought some wine from them, they told me they also have a great farm and a great pumpkin patch in the fall. I was anxious to visit, not only for the pumpkin patch, but to buy more of their wine! This pumpkin patch did NOT disappoint! I was so impressed with all the activities they had set up. The kids loved playing in the corn pit and making “corn angels,” climbing on the hay bales, sliding down the tubes, visiting the farm animals, picking out their own pumpkins and going on the hay ride. They had all kinds of scarecrows dressed up as different characters and decorations to see on the hay ride so it kept us entertained! 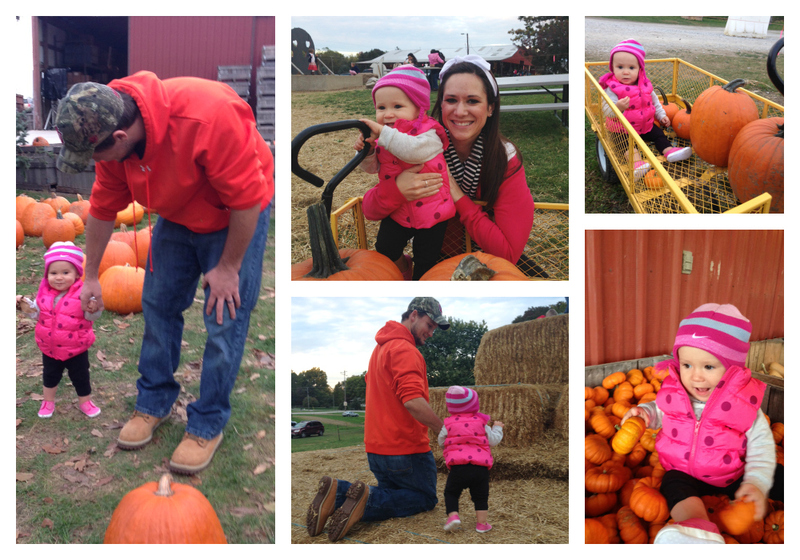 We loved our day at the pumpkin patch! You’ve probably already seen the post about our trip to Florida, but this was definitely one of the best things about our month. We loved spending our days on the beach, lots of cousin time, Mickey Mouse, and having Ryan for a whole week! 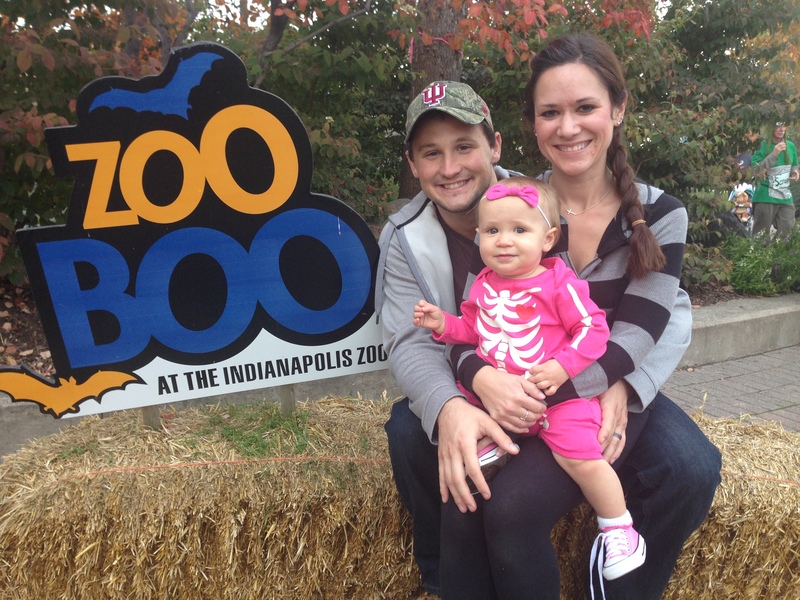 The Indianapolis Zoo Boo was always one of our favorite traditions around Halloween, and we were so excited to find out that the Little Rock Zoo also did “Boo at the Zoo!” For this event, you had to purchase tickets, even if you are zoo members, but there was a lot more to do at this event than at the Indy zoo. 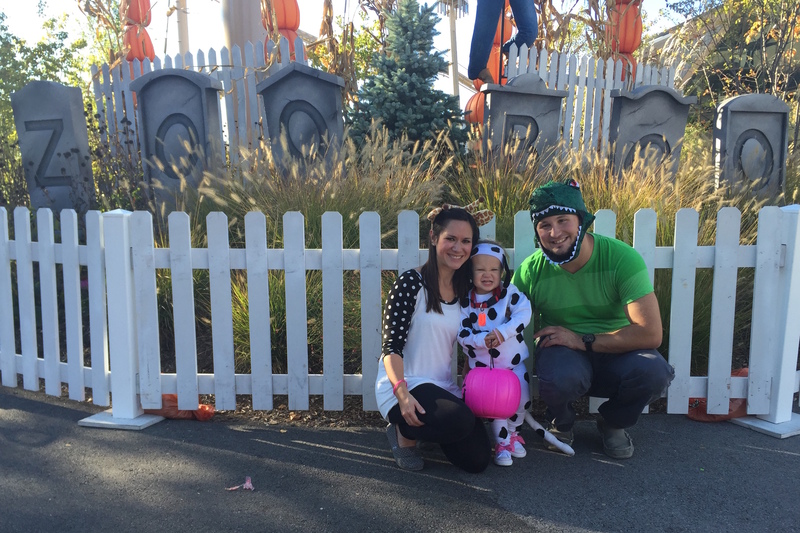 There were carnival games and rides, trick-or-treating, a Haunted House, a “spooky” train ride, food trucks, bounce houses, and tons of Halloween decorations. The ONLY thing I was a little disappointed in was the fact that the event really didn’t have anything to do with the animals. In fact, most of the animals weren’t even out for display. The event focused on the activities, but it was still a lot of fun. We went with another resident’s family whom we’ve gotten pretty close with. The kids all had a great time together and it was a great night. Kinsie is still loving school! They do so many fun activities and themed days. She adores her teacher and finally seems to know all the kids’ names in her class (there are only 8 kids). Some of her favorite things she’s done at school include making apple pie, a martial arts class, and trick-or-treating. And again, I love how much they share on their Facebook page so I can see how much fun she’s having every day! 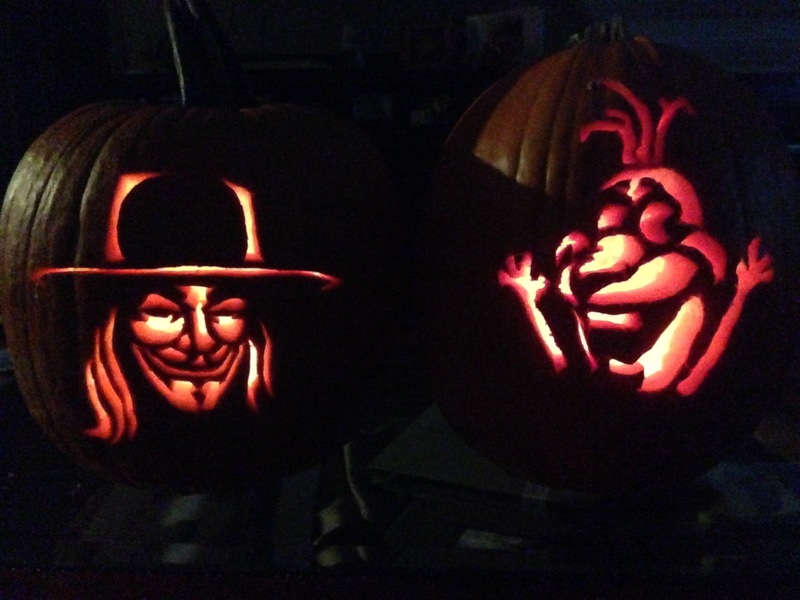 We don’t take pumpkin carving lightly. We go all out every year, and we don’t just do it for the kids…Ryan and I look forward to it every year! This year, Kinsie also really wanted to paint some pumpkins, so I let the kids paint a couple of them. 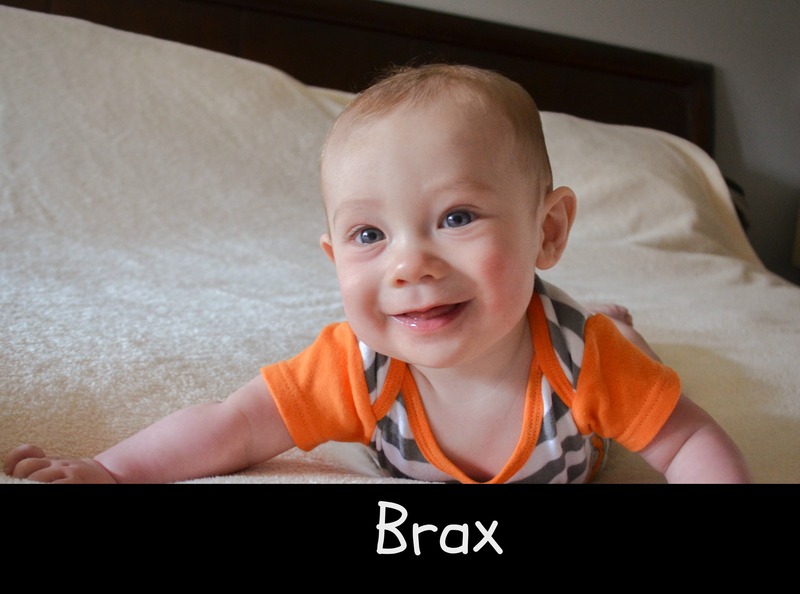 Last time I had Brax paint, he hated it…this time, he loved it! 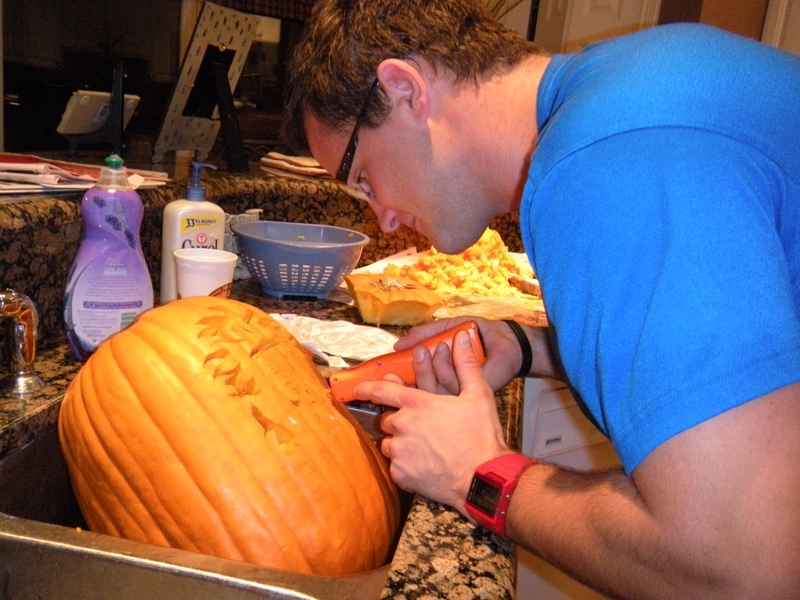 Ryan’s residency group also had a pumpkin carving night, where all the residents and their families could come and carve pumpkins together. The kids loved helping with the pumpkins, running around with the other kids, and all the snacks they could dream of! 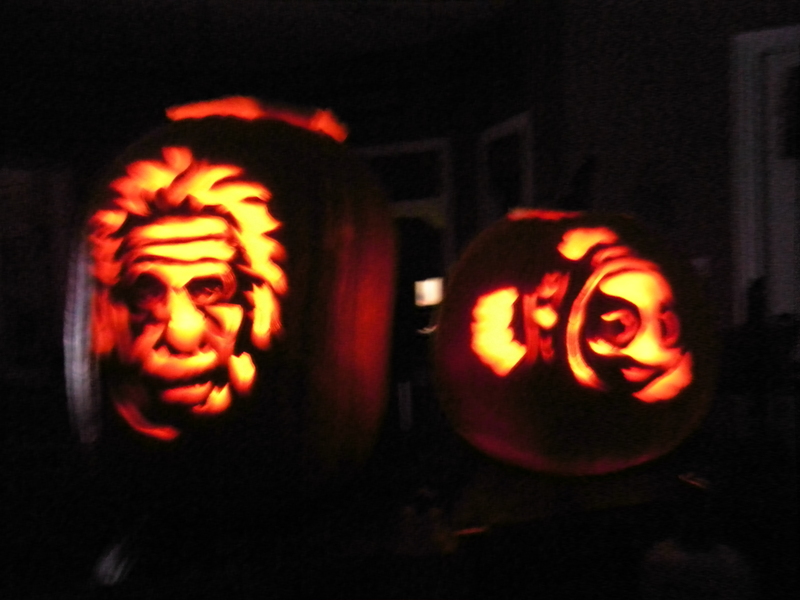 Then, we finally got to carve the rest of our pumpkins. Kinsie really wanted to help with as much as she could, so she helped scoop out seeds, poke the holes for the outline of the design, and even did some minor carving. Brax stuck the spoon into the pumpkin maybe once and then he was done. He spent the rest of the time reading books, climbing into the toy box and running amok while we finished carving. The kids LOVED the end results! Some other activities that we did this month included spending a lot of time in Halloween PJ’s, watching Hocus Pocus while wearing a witch costume, trick-or-treating at Kinsie’s last soccer game, and making Halloween cookies! 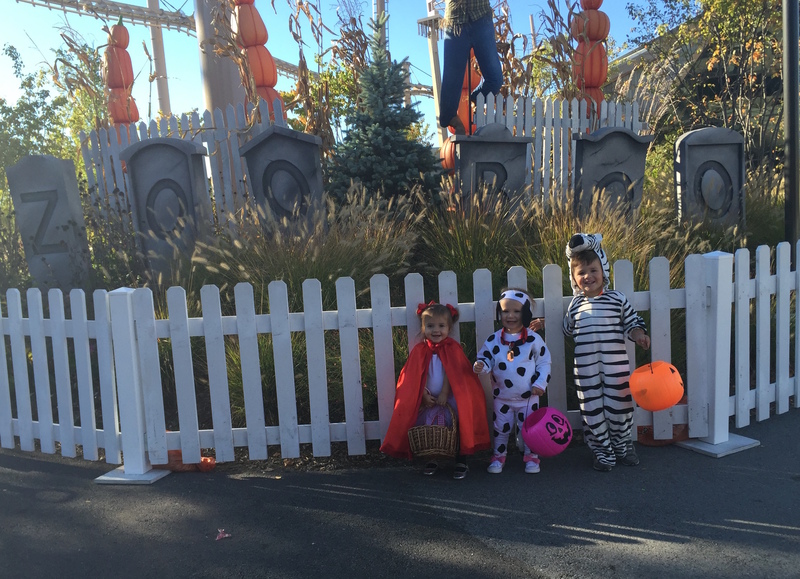 The kids are still young enough that they like wearing coordinating costumes, and we are taking full advantage of it until that day ends! 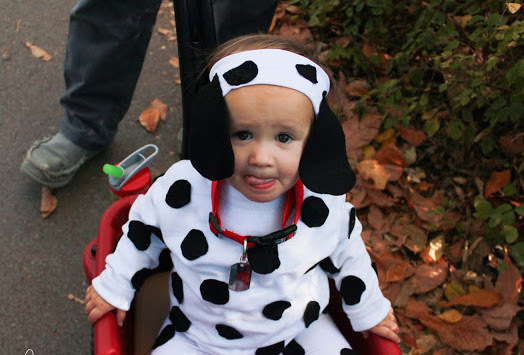 We love doing family costumes, and we always base it off of things that Kinsie is really into at the time. Last spring, she said she wanted us to all be trolls from the movie “Trolls.” Then a couple months after that, she wanted us to all be characters from “Moana.” Then she kind of lost interest in those movies, so we gave her some options from movies she likes. We always call Brax “Stitch” because he destroys everything, so Kinsie thought it was be fitting for her to be Lilo and Brax to be Stitch for Halloween. I found some cute and versatile costumes that I could warm up or cool down depending on how our weather was, and Ryan and I decided to join in on the costume fun again. I decided to be Nani, Lilo’s sister, and Ryan was Agent Pleakley, the green alien from Stitch’s home planet. 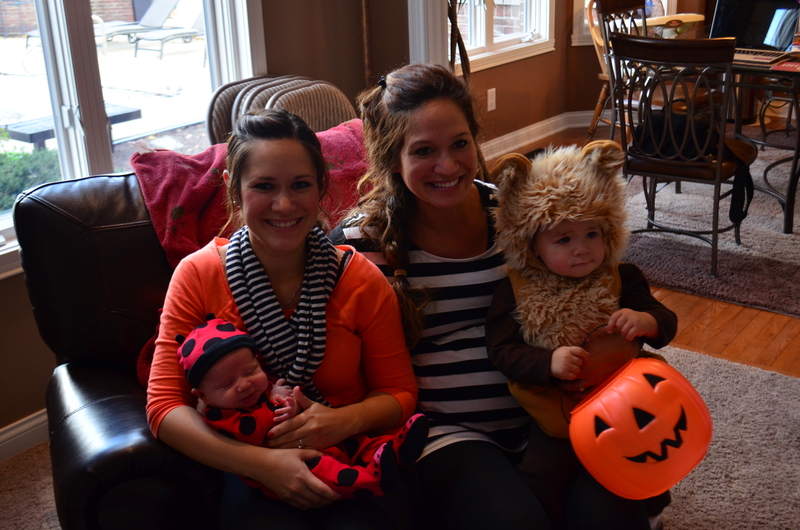 Ryan’s sister, Megan and her dog Ali came to visit us and went trick-or-treating with us as well. 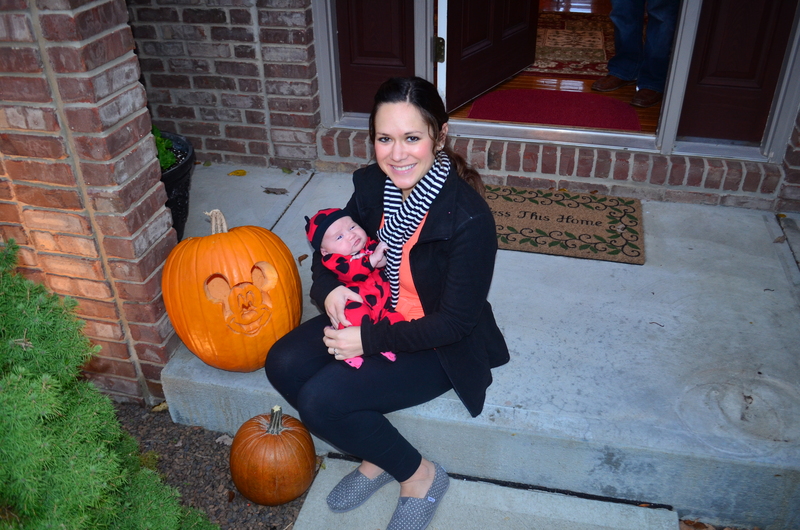 It was pretty chilly, but not so much that it affected our trick-or-treating fun. The kids LOVED it. We walked around our entire neighborhood, and they were exhausted but very excited about how much candy they received! We had a great month! Now with November and December coming up, we know we are going to continue to be busy…which is a good thing for us! We will be headed back to Indiana to be with family for Thanksgiving and then again for Christmas. We are still settling in to our new home, but we become more and more comfortable and feeling “at home” here every day. 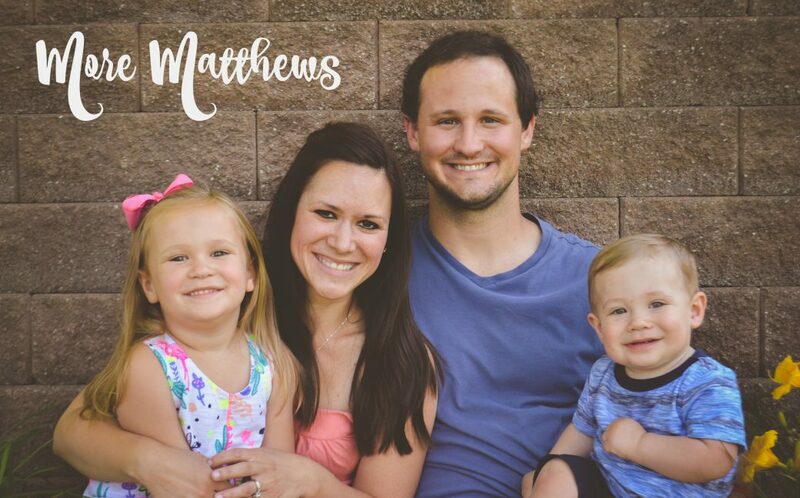 We are in love with the state of Arkansas, and absolutely love living here…but we are still missing our families. We love having them visit, and traveling home to visit them as well. However, with the cold weather season approaching, we are looking forward to spending winter in the south! 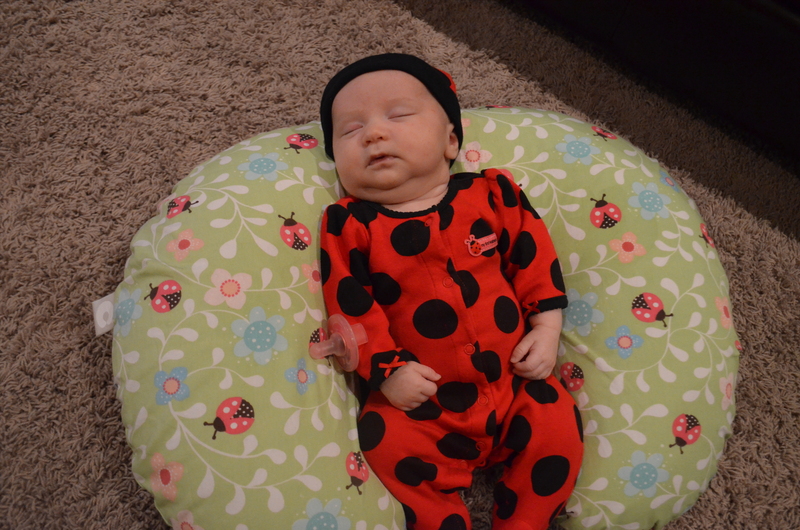 In the early hours of October 8, we were blessed with a beautiful baby niece, Kollyns Sophie Alane Robinson. My sister and I have always been in the delivery room for each other when we’ve had our babies, so I got to witness this sweet girl’s birth and capture her first moments on camera. We didn’t know the gender of the baby until her birth, and she was the tiebreaker among the cousins! 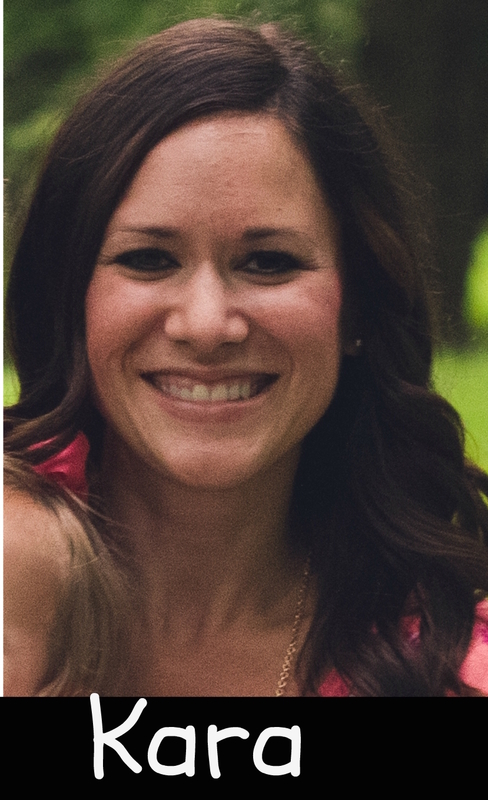 Kinsie said from very early in Krista’s pregnancy that it was a girl…and she was right! Believe it or not, Brax was also very excited to meet his baby cousin. He was extra squirmy and trying to dive out of our arms when we visited her at the hospital! We all absolutely adore sweet baby Kolly! 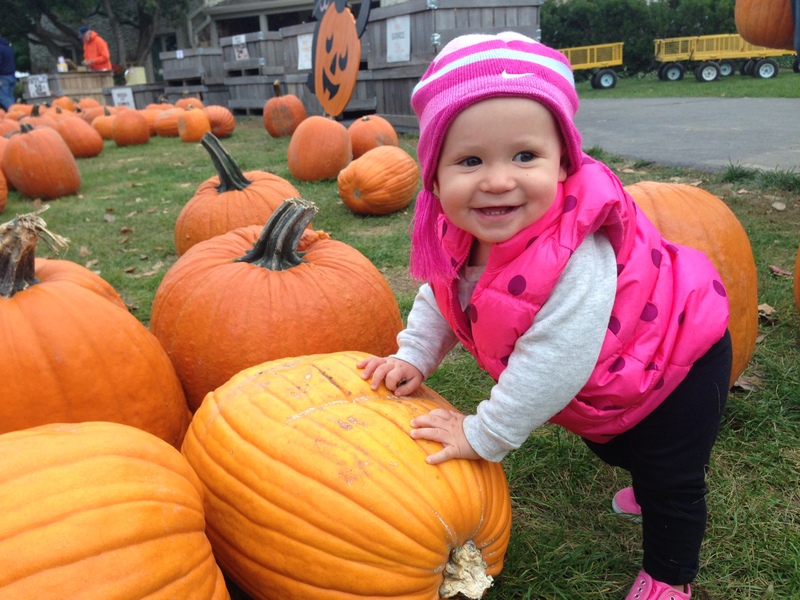 Visiting the pumpkin patch is always one of our favorite things to do in October. Anderson Orchard is our favorite place to pick pumpkins, climb on the hay bales, and eat some delicious snacks (fresh biscuits with apple butter, and apple cider slushies…yes please!) 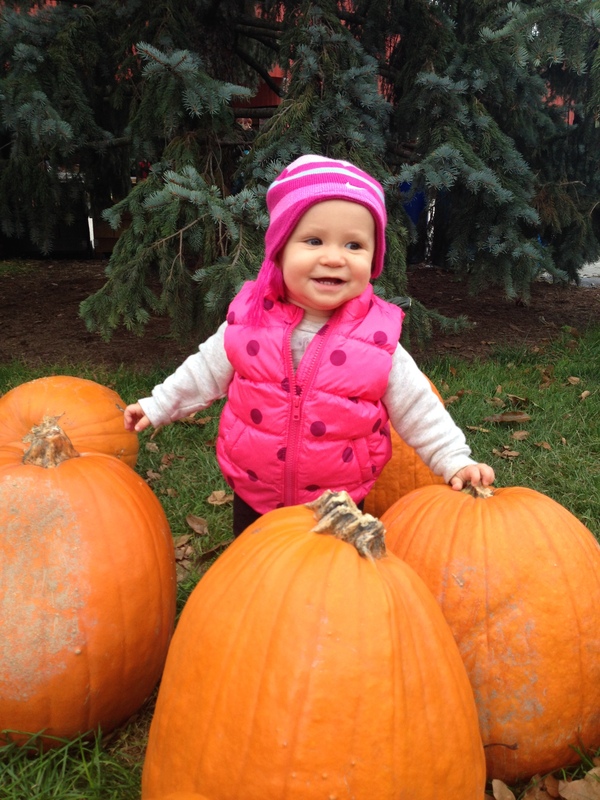 This year, Kinsie helped pick out her own pumpkin and loved showing Brax all the pumpkins. 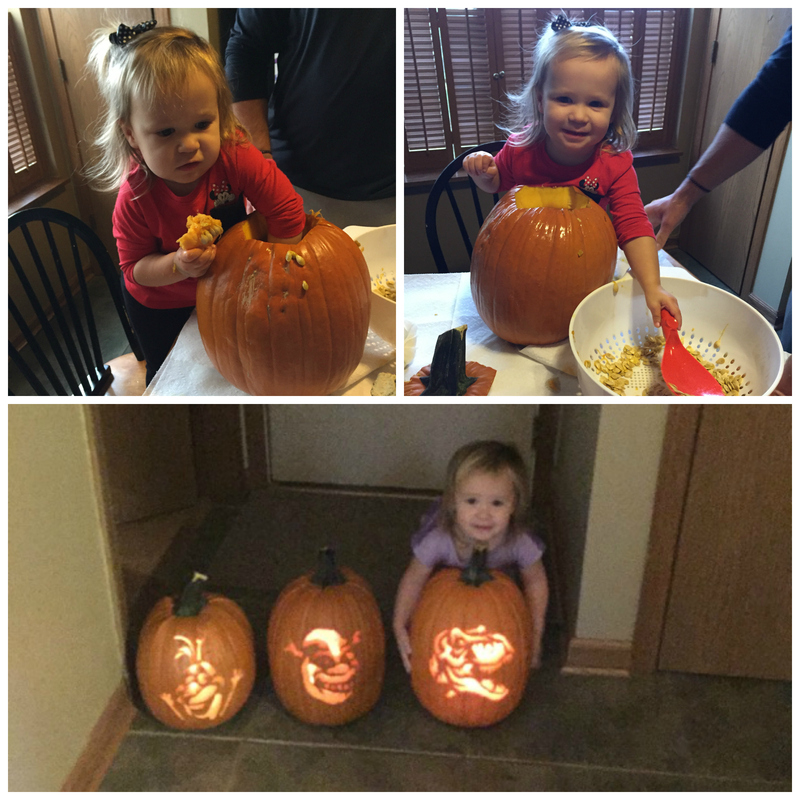 We had 2 very happy little pumpkins! 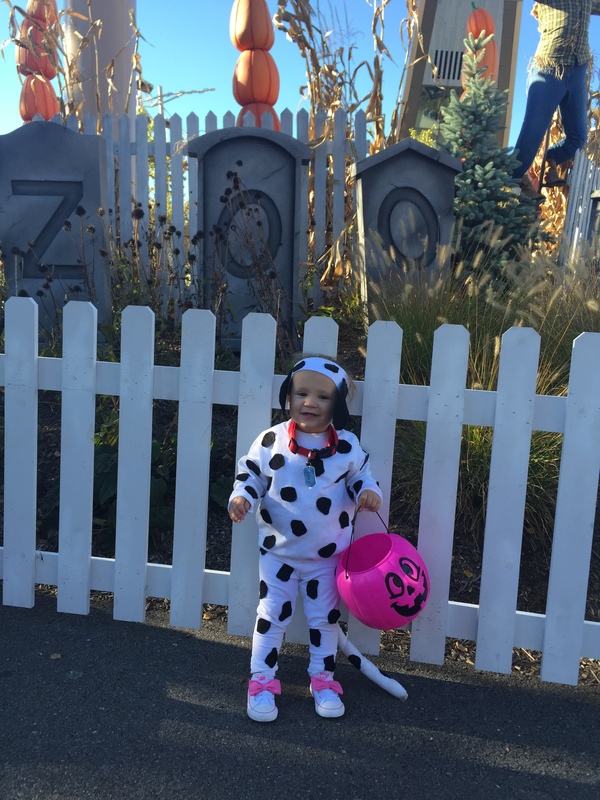 Our original plan was to go to Zoo Boo on Saturday, October 8…but baby Kolly had different plans and decided to grace us with her presence that day! We didn’t mind! 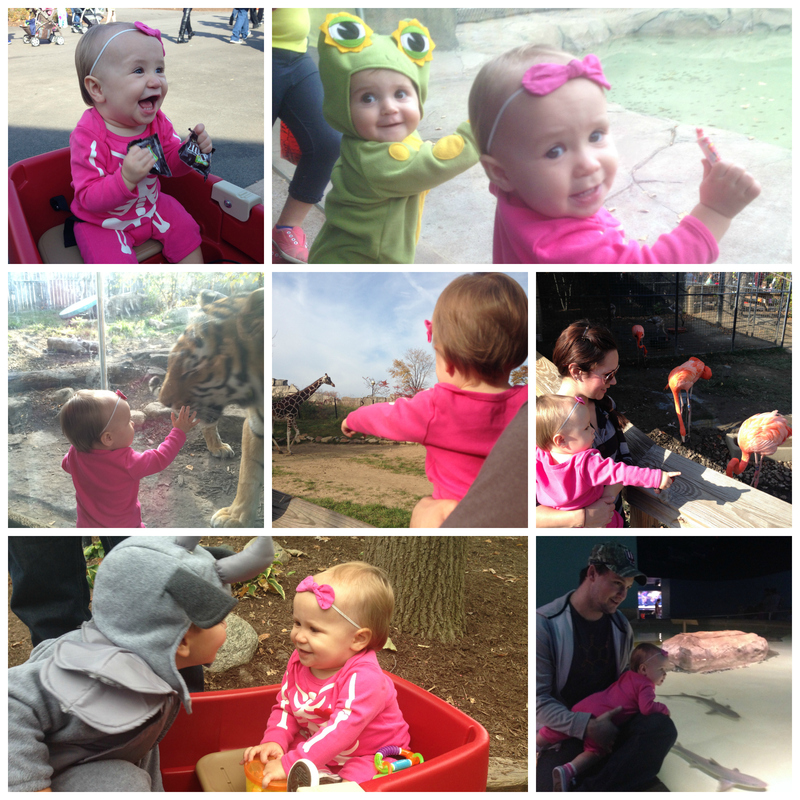 Anyway, we ended up going a week later (Kolly may have broken a record on youngest zoo guest!) Ryan, the kids and I all went as the Ninja Turtles this year for Halloween. It turned out to be a beautiful evening, the animals were very active and the kids had a blast! 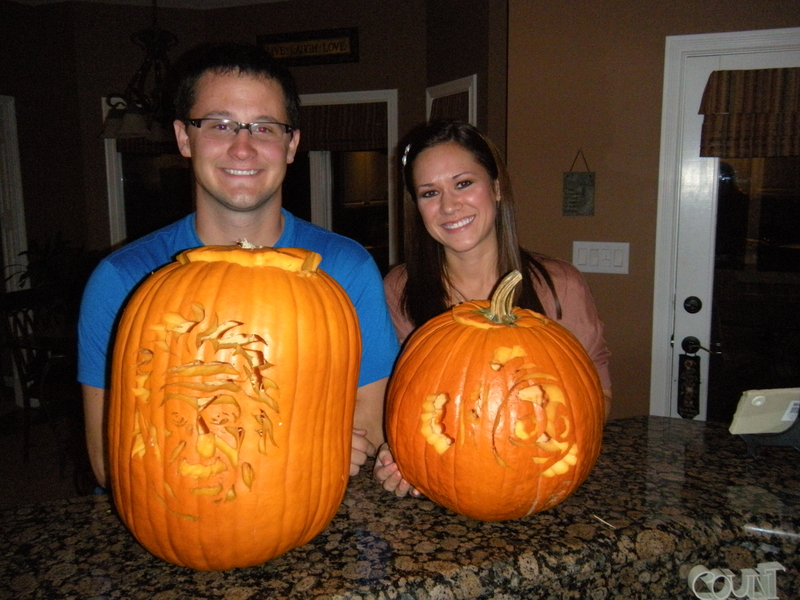 If you remember from past Halloweens, pumpkin carving is one of me and Ryan’s favorite hobbies. 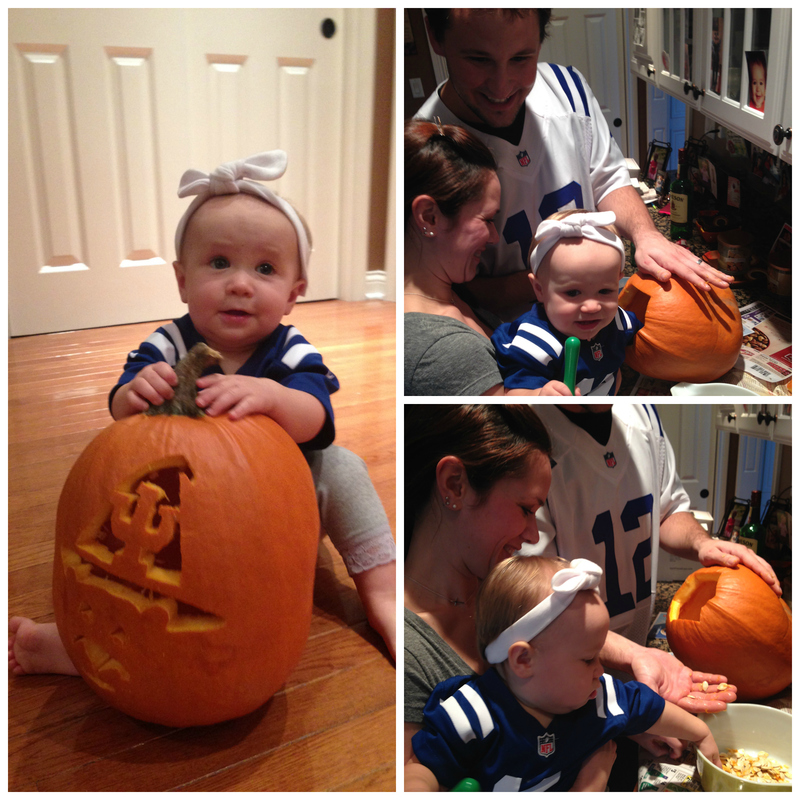 This was the first year that Kinsie really got to help with pumpkin carving. She picked a Ninja Turtle, I picked Dory, and Ryan picked a skeleton dog. We made it a family event and we all helped in the process (well, Brax watched and provided enthusiastic squeals). We were pretty happy about our finished products! 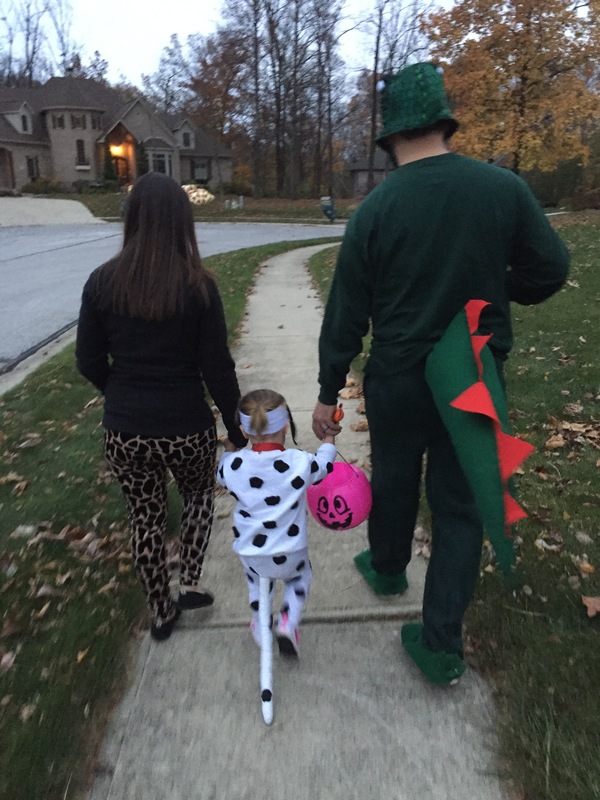 This year, we went trick-or-treating at my sister’s neighborhood so Kinsie could be with her cousins. The neighborhood was perfect for the kids to go door to door and they did such a good job saying “trick or treat!” and thanking the people after they got their candy. Both of my kids were pretty pumped about all the candy they got, and Brax was even nice enough to give all his candy to Kinsie! It was a great night! Another eventful October in the books. This one was even more special because we got a new member of the family. The holidays are coming up so stay tuned for more updates soon! 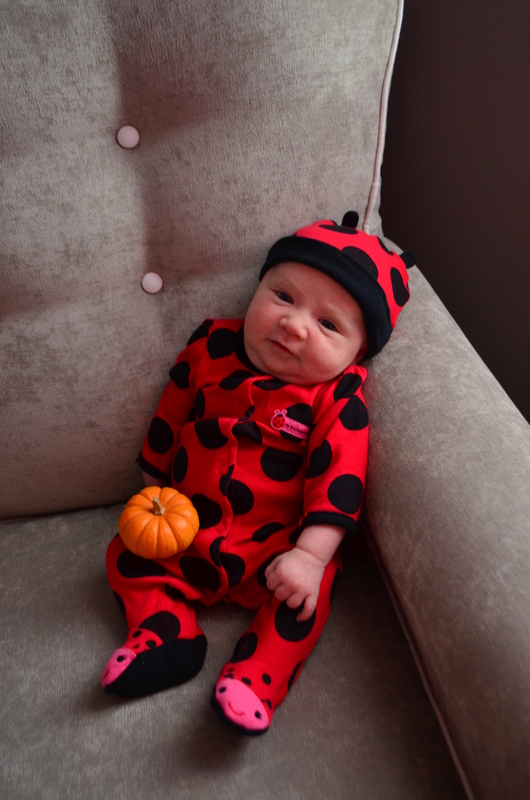 Ever since I stopped dressing up and trick-or-treating, I have never been that super crazy about Halloween….until I had a child. Now I think that Halloween is even more fun with a child than when I was a child! Kinsie got really into Halloween this year, as soon as costumes and decorations started being sold in stores. I wanted her to pick what she would be for Halloween, so we thought about the things that she was into at the time and gave her a choice. She chose a dalmatian puppy. 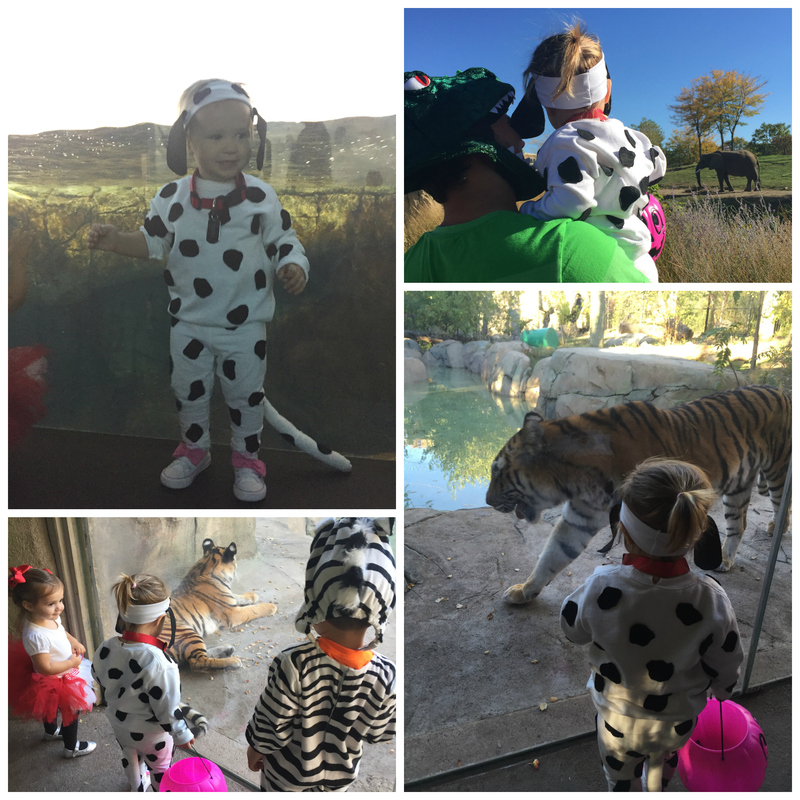 We found lots of opportunities throughout the month for her to wear her costume. We went to Zoo Boo, then we went to a kids Halloween party at Heritage Lake, we went trick-or-treating on Halloween night, and then finally went to a costume cookout at my sister’s. Kinsie was always such a happy puppy. I may have to take her puppy costume with us everywhere we go just in case she is in a bad mood…it would perk her right up! Like I mentioned in my last post, Kinsie was quite the little pumpkin picker. We let her decide what she wanted on her pumpkin, and, to no surprise at all, she wanted Olaf. 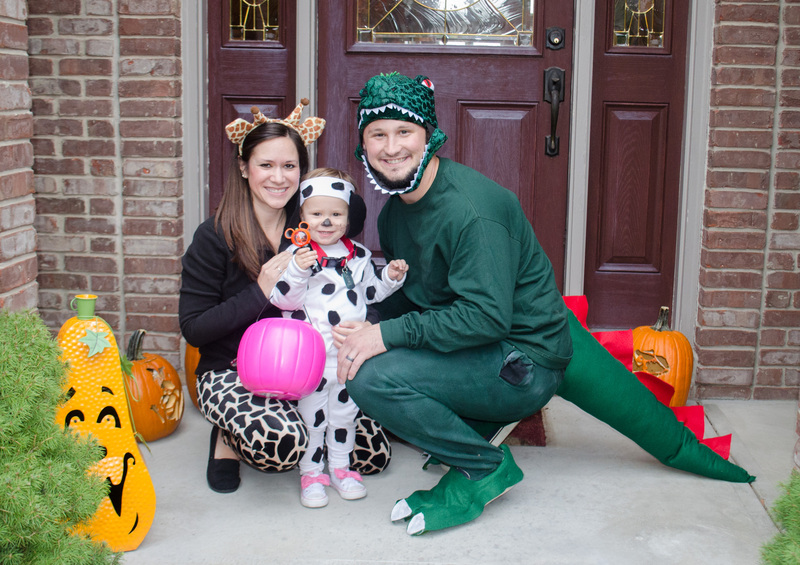 We also let her help us pick out what we would put on our pumpkins, so we went with Shrek and a dinosaur. We let her help clean out her pumpkin and collect the seeds so I could bake them. We weren’t sure what she would think of the slimy pumpkin guts, but she didn’t mind at all! She was really excited about her Olaf pumpkin when we finished carving it. 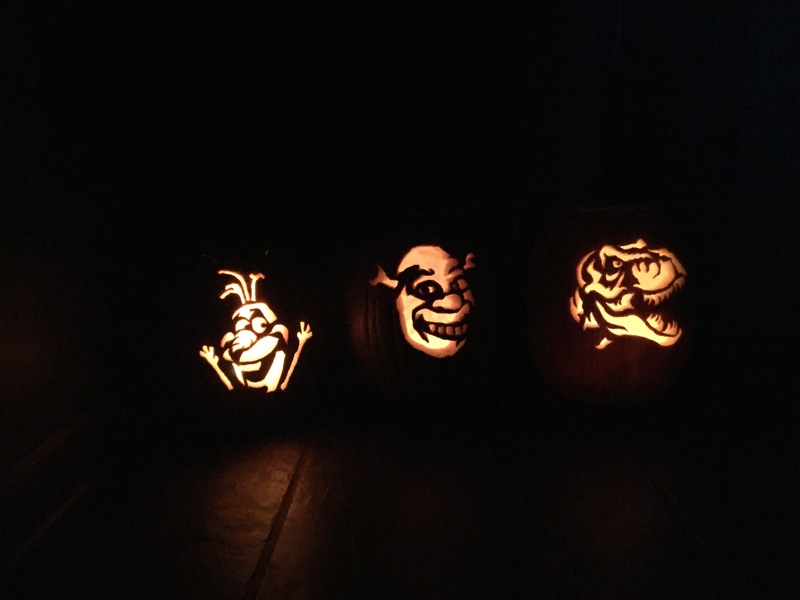 Then later that night after she went to bed, we carved Shrek and the dinosaur (while watching Hocus Pocus of course). 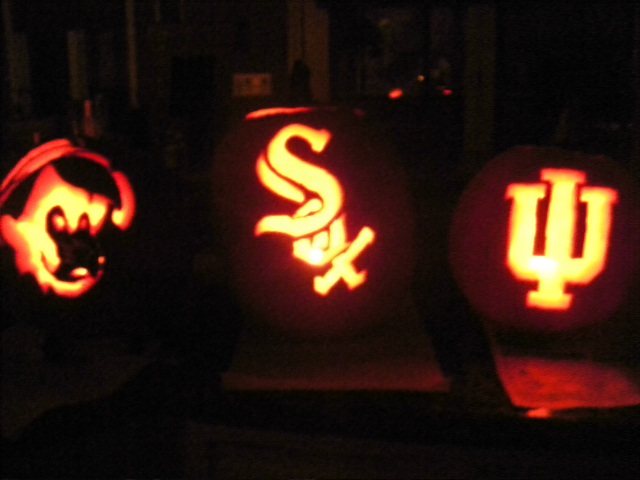 When Kinsie woke up the next morning, she was super excited about all three of her pumpkins! 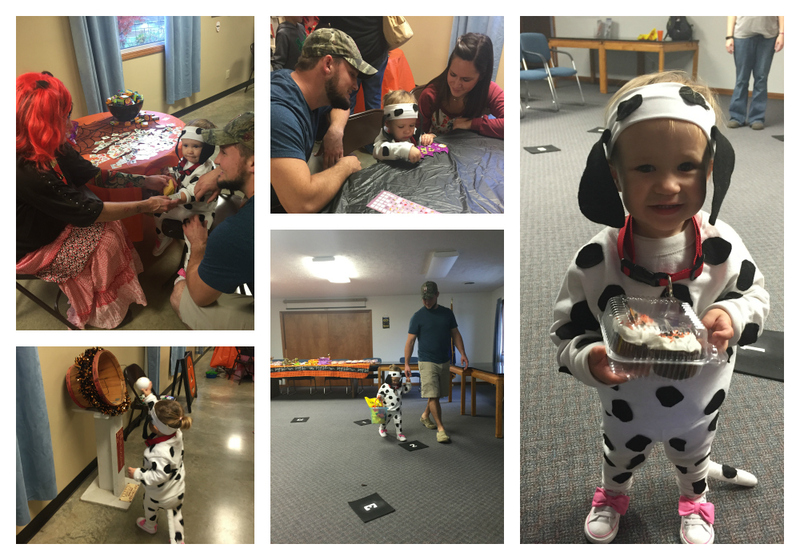 The week before Halloween, Heritage Lake was hosting a kids Halloween party. We got Kinsie suited up and took her, and it was a lot of fun and perfect for her age. They had crafts, snacks, carnival games, a cake walk, and dinner. She did that cake walk for a good 30 minutes and every other kid around her would win, but not her. She was determined to stay until she won. Finally, with us and the people in charge of the walk rooting for her, she won! She was pumped about her cupcake prize! Another one of the highlights of the night was the tattoo station. Kinsie got to pick out which tattoo she wanted, and of course she picked the dinosaur. She was so proud of her tattoo, she would show everyone and even talk about it in her sleep! Halloween fell on a Saturday, so Kinsie had soccer that morning. The kids were encouraged to wear their costumes, so of course Kinsie was down for that. 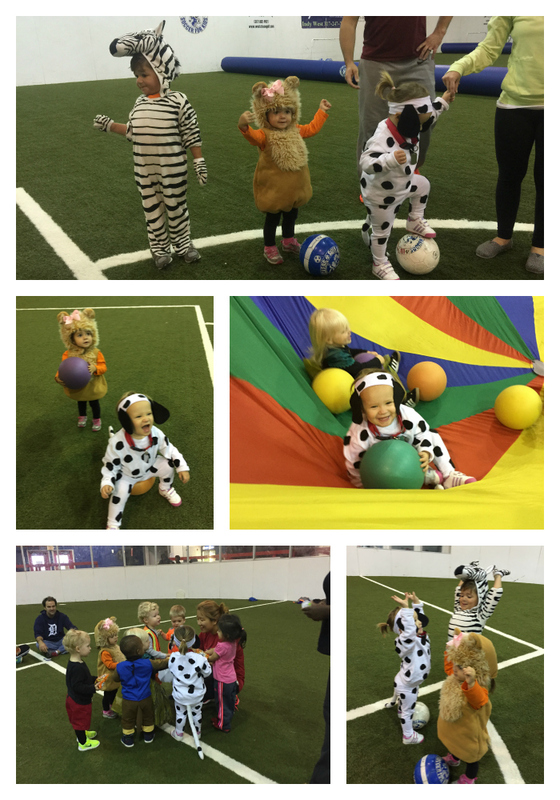 She has soccer class with her cousin Kerigan, and her third cousin, Emery…so the girls (and Briggs) had fun running around playing soccer in their costumes. Kinsie loves playing soccer, but she is often anti-following directions in class. Not this week…I swear, that puppy costume works wonders! 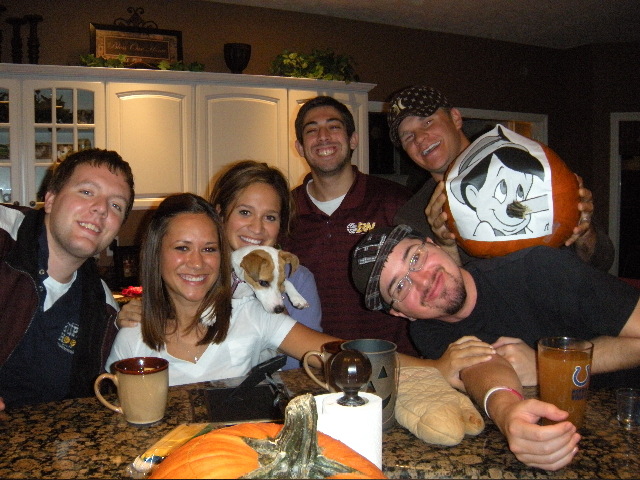 For Halloween night, we went to my parents’ neighborhood, and Ryan’s parents and brother joined us. We just trick-or-treated around their cul-de-sac, and as soon as we got back around to my parents, it started raining…but by that time, Kinsie’s little puppy legs were getting tired anyway. 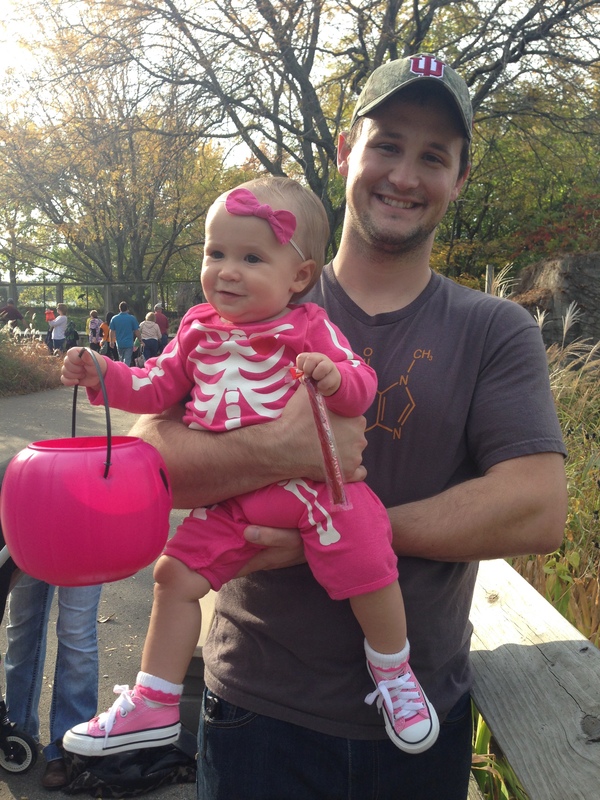 She was so cute trick-or-treating, and she thought it was so much fun! She has never really had much candy in her life, but she was excited about all the candy she was getting. When we got back to my parents, she enjoyed helping pass out candy to other trick-or-treaters. I let her have a couple pieces of candy, which kept her occupied most of the evening while we watched Hocus Pocus (yes, again…there is no limit as to how many times I can watch it during the Halloween season). Kinsie had such a fun night, and, a week later, she is still carrying around her pumpkin full of candy everywhere she goes! The next evening, my sister had a little costume cookout for our family and some close friends. 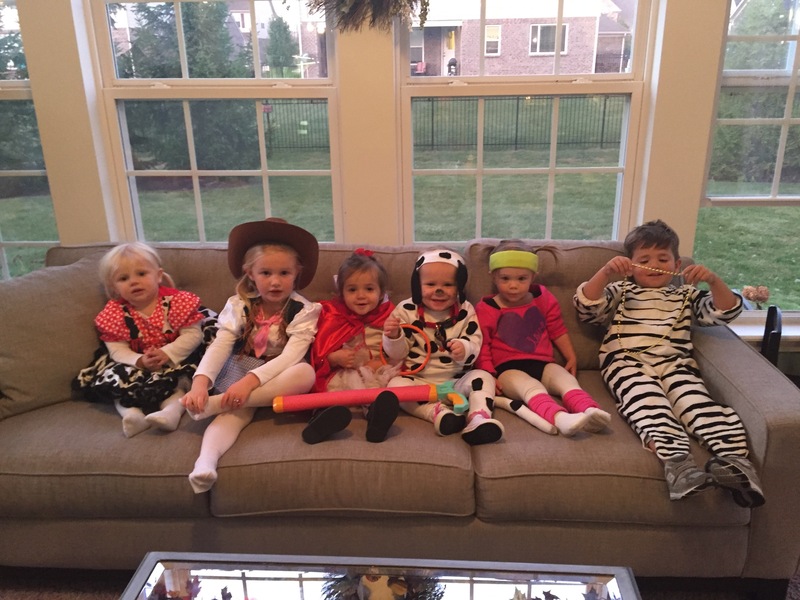 The kids had one more opportunity to wear their costumes, so they were ready to party. We had food, sat around the fire, and let the kids run around and make forts in their costumes. It was a lot of fun! Once Halloween was officially over, Kinsie got pretty upset, especially when our neighbor put away his big inflatable black cat and gargoyle (she loved looking at them through the window every night). But we had to remind her, that now Christmas will be coming soon, and we can celebrate that. She is already talking about Santa Claus and Christmas trees! Like I said before, holidays are so much more fun with a child! 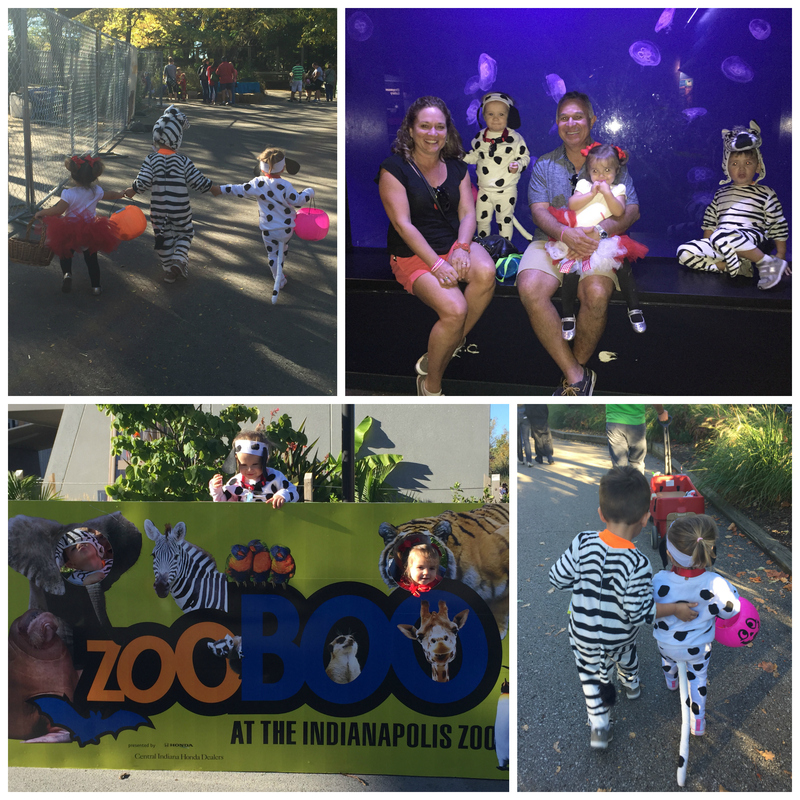 One of our new favorite fall traditions is to go to the Indianapolis Zoo Boo. 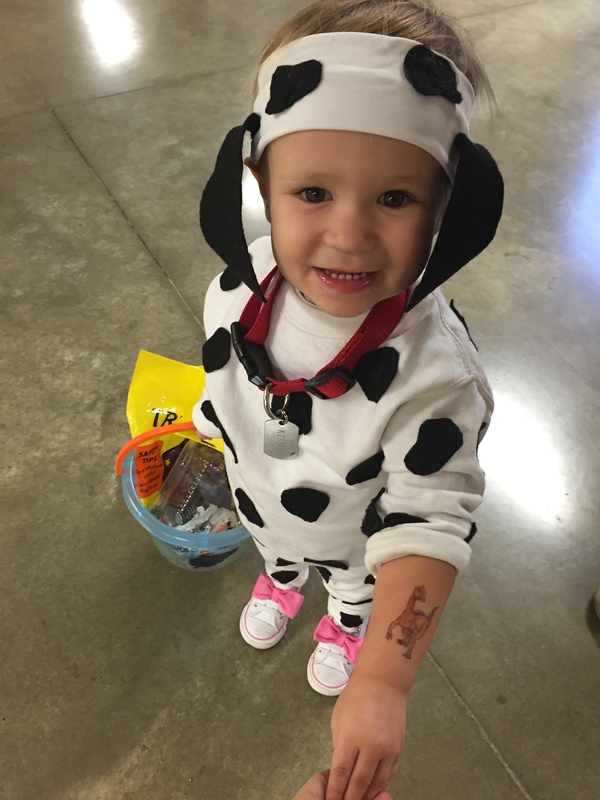 Last year, Kinsie wore her skeleton outfit, but this year she was super excited to wear her costume – a dalmatian puppy. 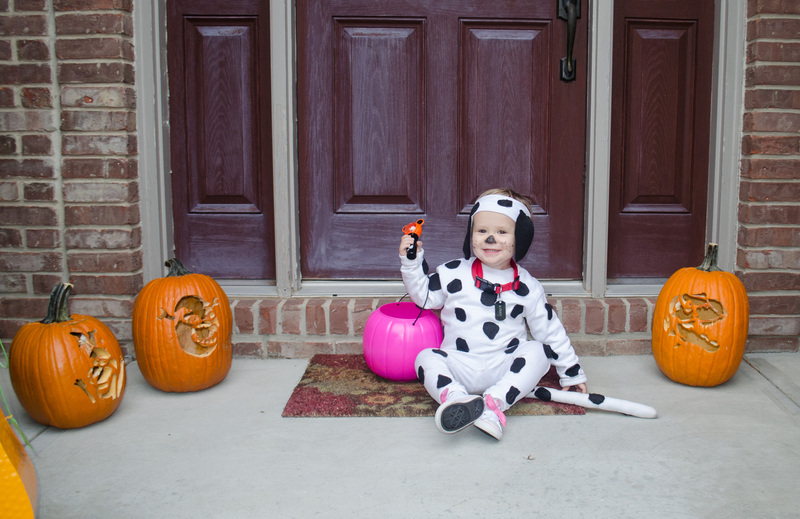 Ryan and I weren’t crazy about the dalmatian costumes in stores and online, so we made one, which was modeled after the dalmatian costume my mom made for my sister when she was young. 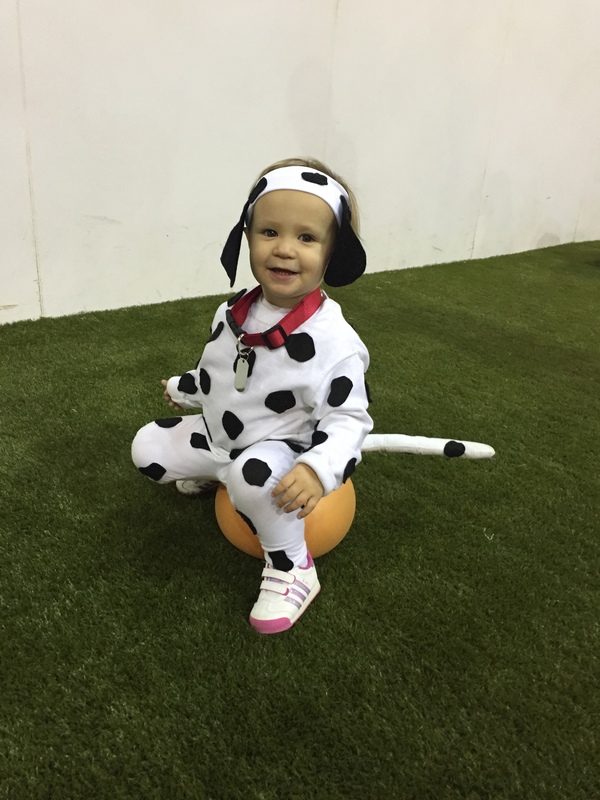 A white crewneck sweatshirt, white pants and some black felt and boom – you’ve got yourself a pup costume! We also may have bought her a real dog collar with a name tag that says her name too! Anyway, Kinsie LOVES her costume. She wants to wear it all the time around the house…so we’ve been trying to find as many opportunities for her to dress as a pup as possible! 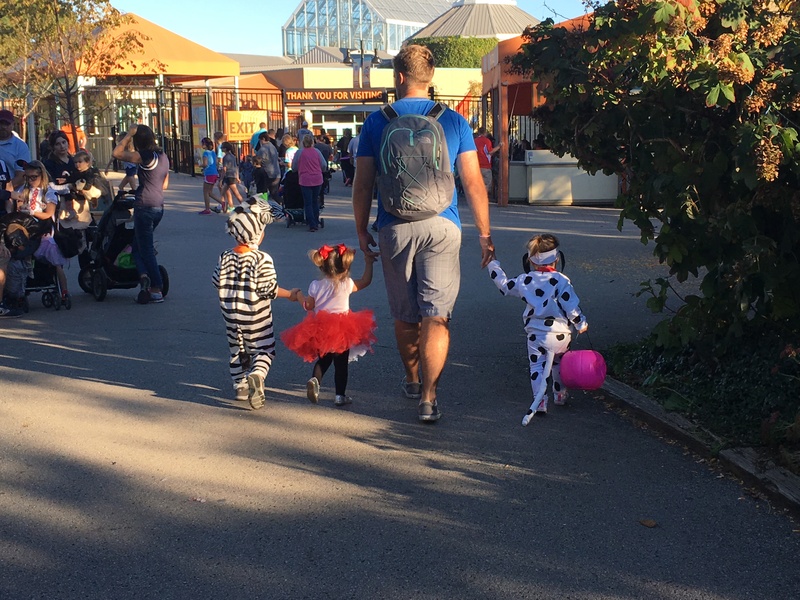 The zoo is still one of her favorite hangouts, and its even better when her cousins are there too! The three musketeers spent most of the afternoon hand-in-hand, and eventually they recruited Uncle Ry Ry to join in on the hand-holding too! 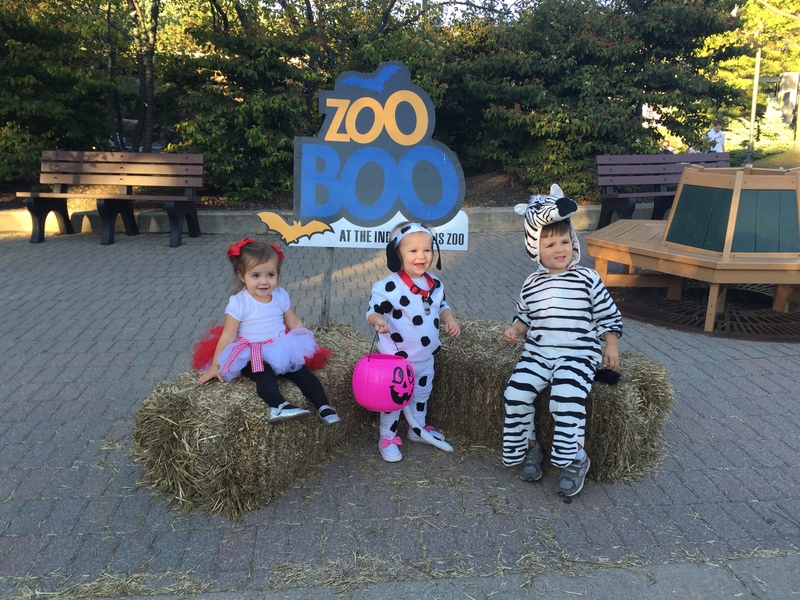 We all had a blast at the Zoo Boo! Stay tuned for more fall and Halloween posts coming within the next few weeks! We have had an extremely busy fall season so far! Between teaching, the busy season of photography and chasing around a 1-year-old, I’ve hardly had time to breathe let alone sit down and write a blog post! Ryan has also had a very intense semester so far. He’s had an average of 2 tests per week, which means he is spending the majority of his time studying. I have to give him a lot of credit though, even in the midst of a very demanding semester, he has still managed his time well enough to enjoy lots of quality time with Kinsie and me. Luckily, this was the first year that IU had a fall break, so Ryan had about 4 days off at the end of October, and even better, it happened to fall on the same week as my fall break! Because of our limited time together, we are always thankful for any extra days we get to spend as a family. As Kinsie gets older, she is becoming more and more aware of when her daddy is around and when he’s not. When he’s not home, she does ok and still has fun, but when he is home, she is clearly in her happy place. 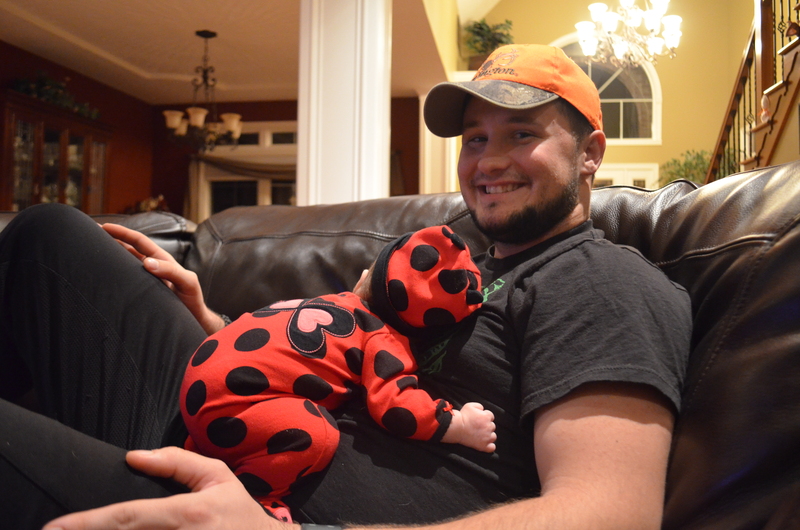 She LOVES having her daddy home and she will spend all her time wallering all over him and giving him hugs and kisses. 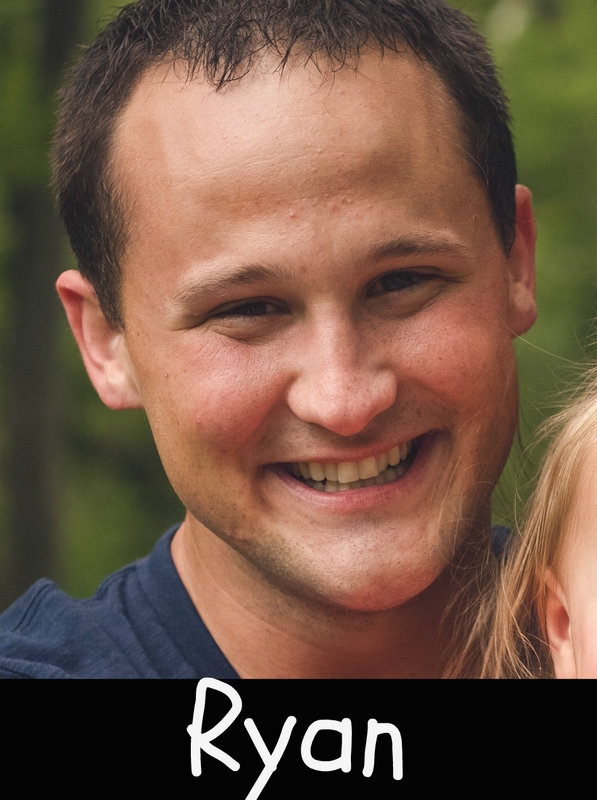 While it is harder this year to have him gone since Kinsie is older and more aware, I am grateful that she was so little throughout most of Ryan’s time in Muncie, and that he’ll be back home with us before she turns 2. We’ve had lots of fun adventures over the last month with our girl. We took her to the pumpkin patch for the first time, which she loved! She could have crawled around and climbed all over the pumpkins all day. We went to Anderson Orchard for the first time, and we were very pleased with it. Good prices and lots of fun family activities! 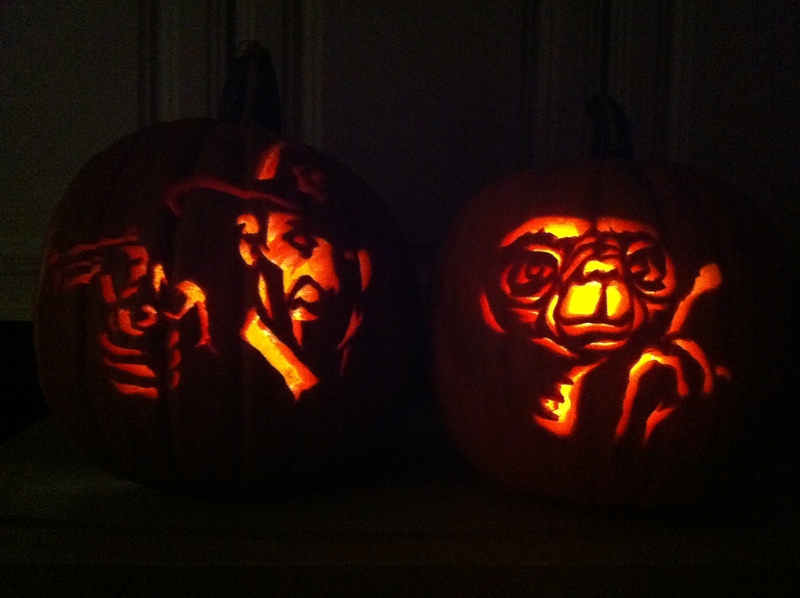 As I mentioned last year, Ryan and I always go all out on carving pumpkins. 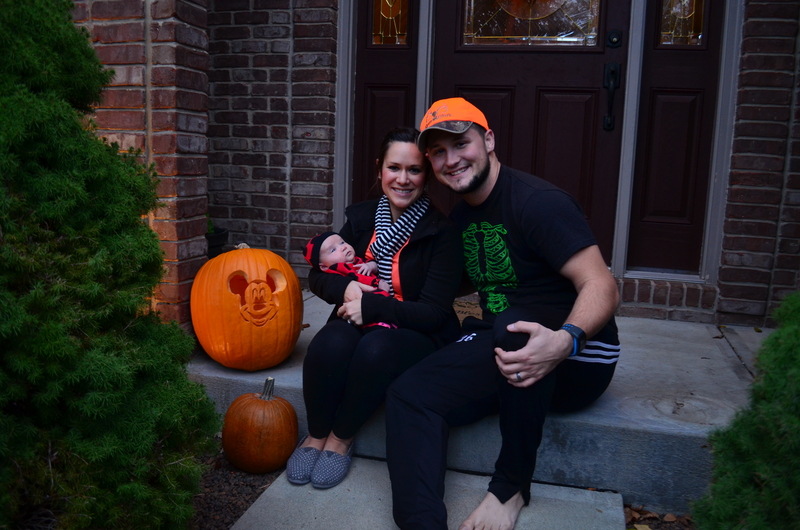 Last year was a little different because we were busy with a newborn, but this year we made sure that we made time for extreme pumpkin carving, and we even got to include Kinsie in the fun this year. We let her help clean out her own pumpkin. She wasn’t so sure about sticking her arm in the pumpkin and taking the seeds out, but she LOVED seeing her carved pumpkin all lit up! 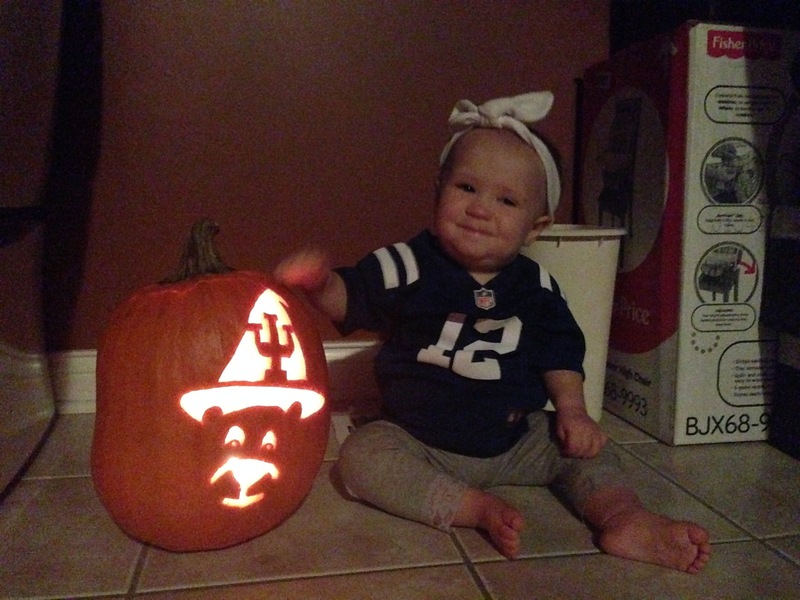 Proud of her Hoosier bear pumpkin! 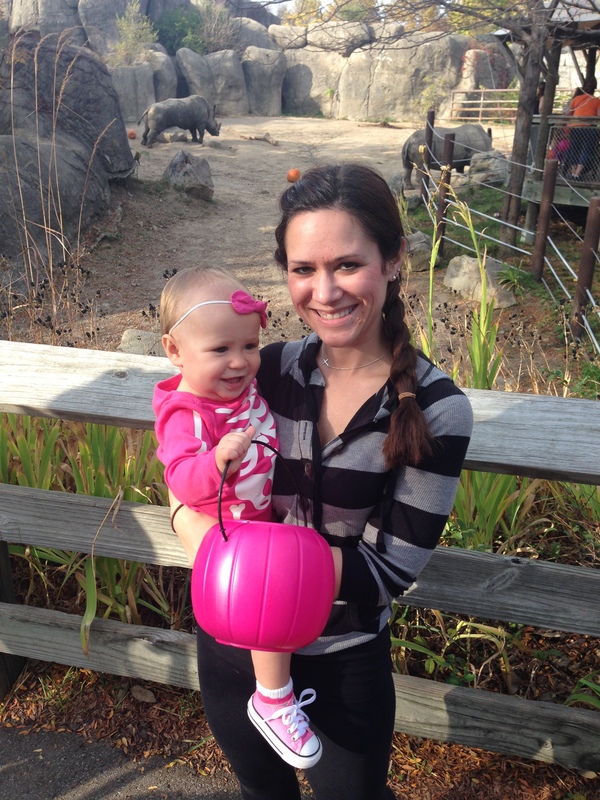 As you know, Kinsie is obsessed with animals, so we take advantage of any opportunity we get to take her to the zoo. 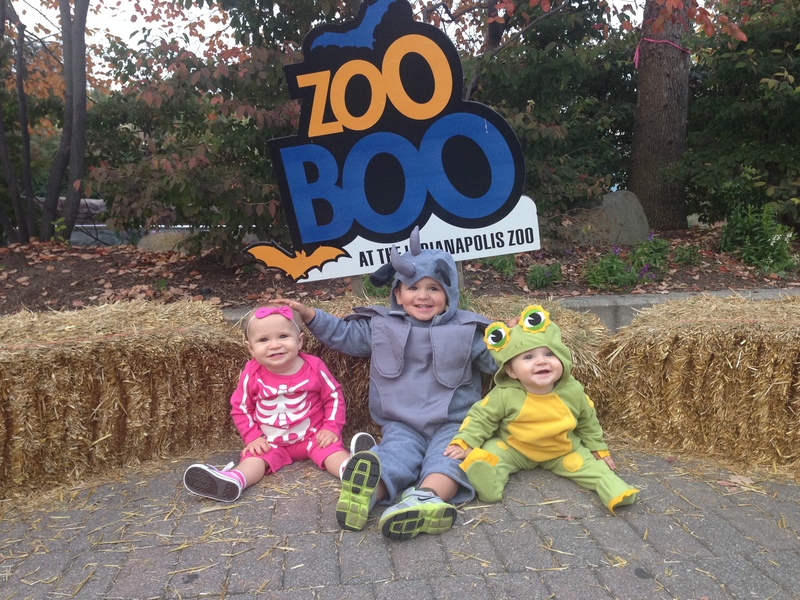 During the month of October, the Indianapolis Zoo has their “Zoo Boo” where kids dress up in their costumes or Halloween gear at the zoo. 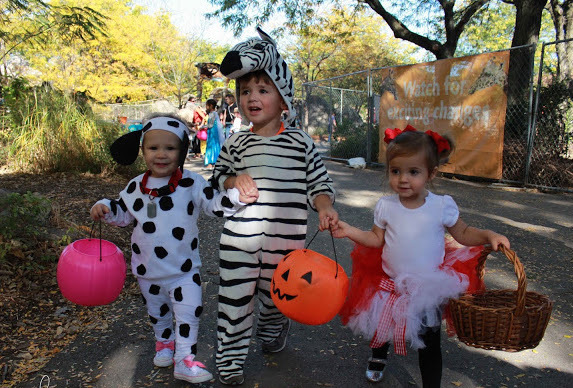 A lot of the animals play with pumpkins, and zoo workers pass out candy. 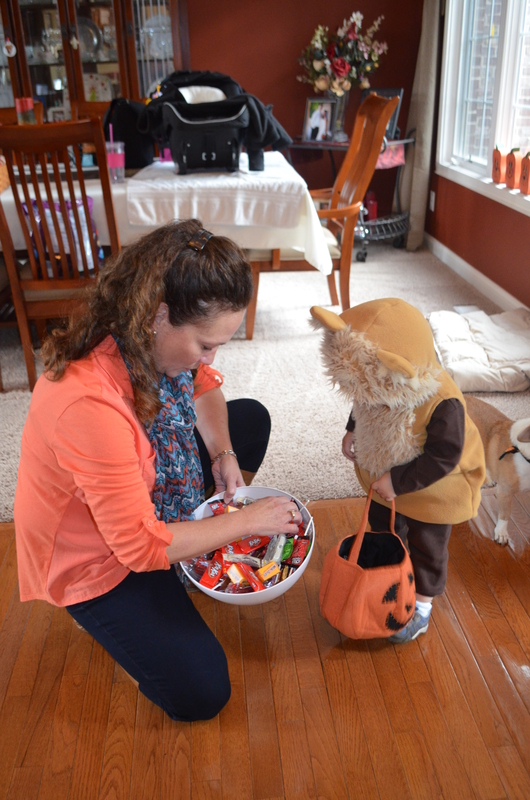 It took Kinsie a while to understand the idea of collecting candy, but soon she became a pro. We later met up with my sister and her family, so the kids got to have cousin fun at their favorite place! 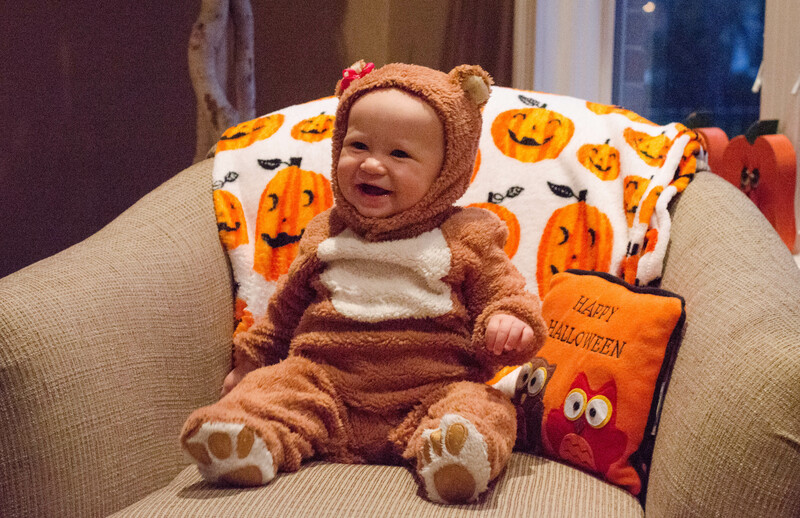 This year for Halloween, we dressed Kinsie up as her favorite animal, a bear. 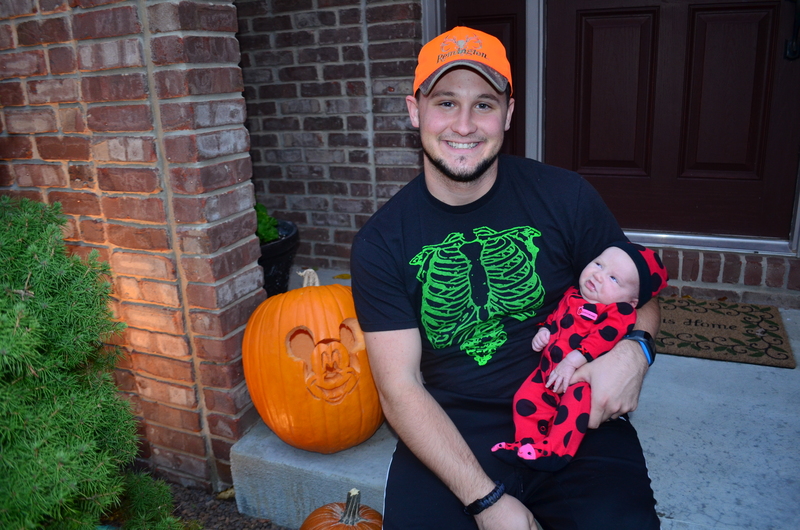 We were really excited to take Kinsie around in her wagon to go trick-or-treating for the first time. However, those of you in the Indy area know how awful the weather was on Halloween night. 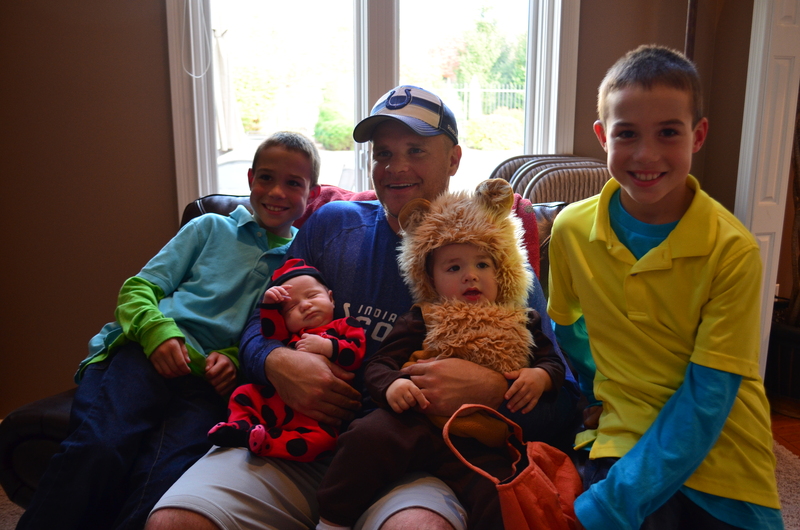 It was probably 30 degrees, windy and rainy…so we had to change our trick-or-treating plans. We just drove to my parents house and helped pass out candy to the brave and dedicated ones who did walk around outside. 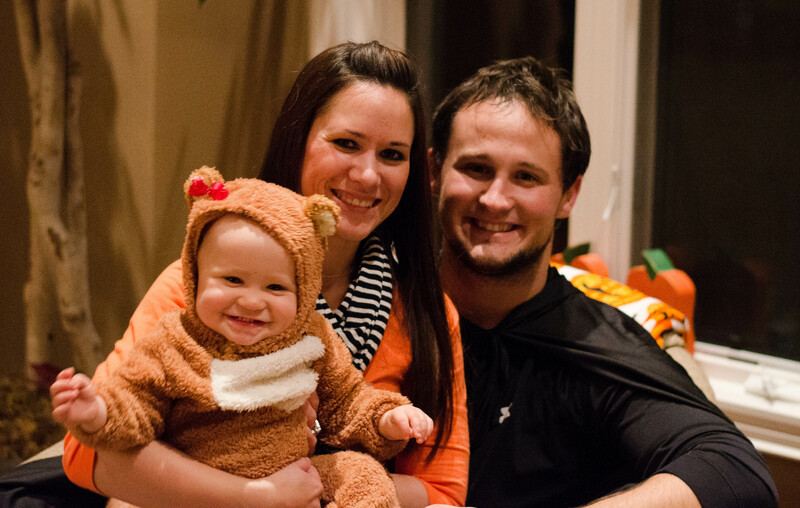 Ryan’s family visited as well, so our little bear still had fun! Kinsie and I were very grateful to have Ryan home with us for a few extra days, and that he was able to go on all of our fun fall adventures with us. 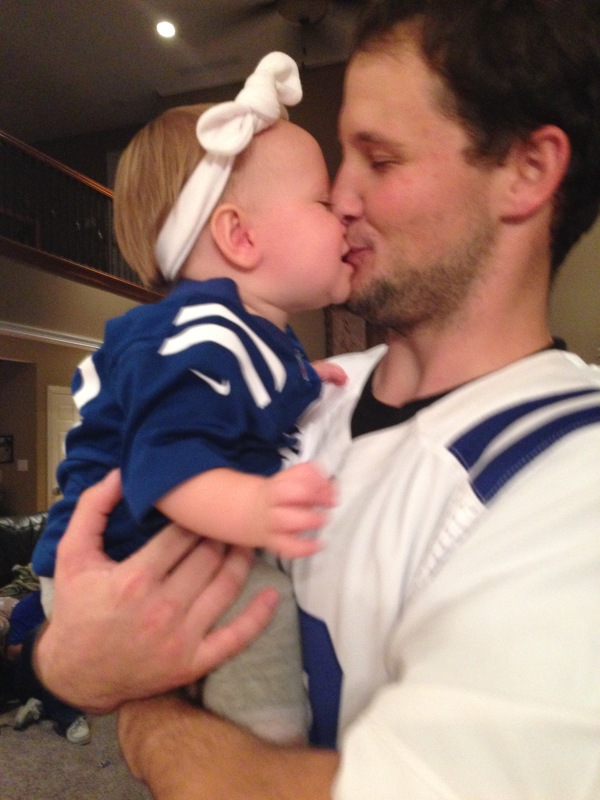 Kinsie always cherishes any time with her daddy that she can get! I’ve never been much of a fan of Halloween. I believe it is a fun holiday for kids, but other than that, I think it is taken a bit out of hand. I haven’t dressed up or gone to a Halloween party since high school. Call me a Halloween “Scrooge,” but it’s just not my thing. However, that has never stopped me from enjoying the beautiful season of fall. Every year, my sister and I like to have what we call a “Fall Foliage Festival” where we all carve pumpkins, eat pumpkin seeds and caramel apples, drink apple cider, and watch Hocus Pocus. To be honest, it is one of my favorite traditions that we do all year. 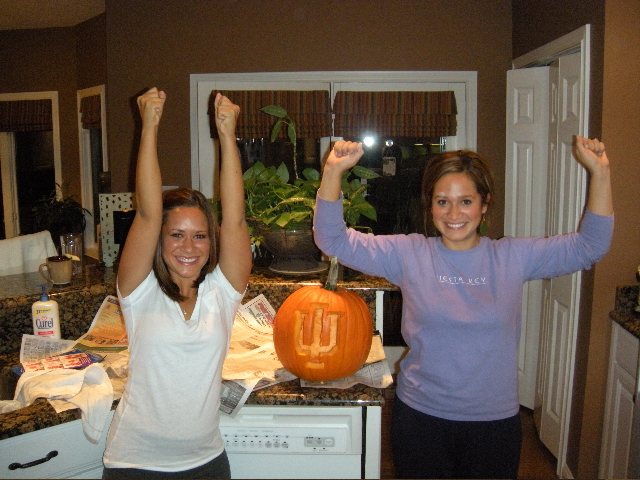 We would always carve quite extravagant patterns and display them at our parents house on Halloween night. This year was a little different for us. With Ryan and I having a newborn and him living in Muncie, and with Krista being 9 months pregnant and moving into a new house, it was a little difficult to find the time to have our annual Fall Foliage Festival. We never even got the chance to go to the pumpkin patch! Obviously our family had a lot going on this year, but they were all good things, so I didn’t let myself get too sad about missing our tradition! I felt bad not having anything on my parents porch for the trick-or-treaters, so the night before Halloween, my mom and I bought a pumpkin. While I watched the baby, she emptied it out and got all of the seeds for my dad to bake, then she watched the baby while I carved the pumpkin. 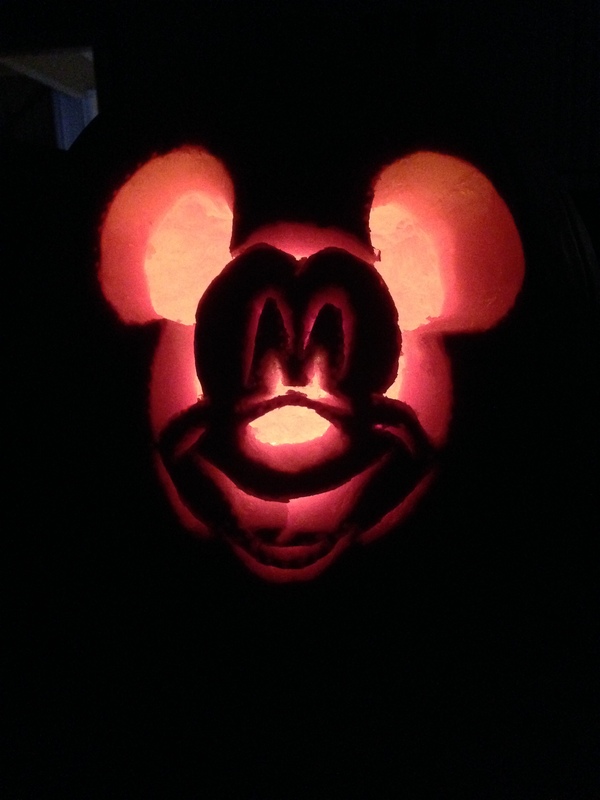 I wanted to do something simple that wouldn’t take me hours like it has in the past, so I chose to make Briggs happy and carve a Mickey Mouse face (yes, this is my idea of “simple!”) I was pretty happy with it considering what little time and energy I have these days! Now that I have a child, I feel like I get to enjoy what Halloween is really about again. 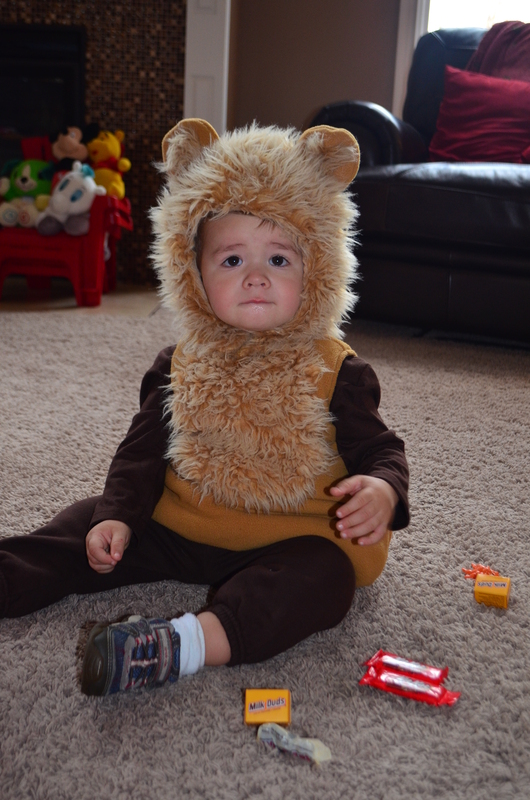 Even though Kinsie is only a month old, it was so much fun dressing her up and hanging out with her cousin, Briggs (who was a lion). Kinsie was in somewhat of a grumpy mood on the night of trick-or-treating, and all she wanted to do was sleep, but we still had a fun night at her Grandma and Grandpa Vargas’s house watching Hocus Pocus and eating candy! 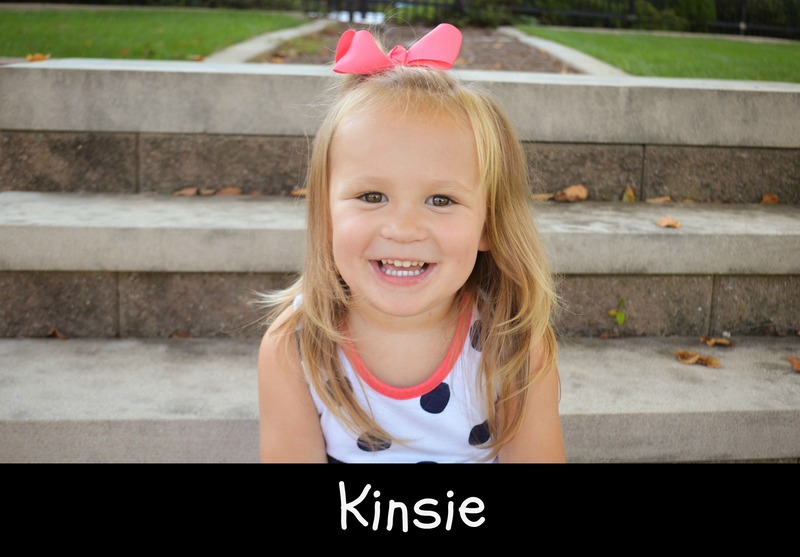 It is crazy to think that next year, Kinsie will be a year old and her, Briggs, and her new cousin will be running around trick-or-treating together. Our family is growing every year and every day I thank the Lord for these amazing blessings!